January 23, 2019 February 1, 2019 Daniel Gouré, Ph.D.
Click here to read the full report as a PDF. The return of great power competition and the emerging focus on multi-domain operations has altered the role of the Marine Corps and amphibious warfare fleet. New potential conflict scenarios involving China, Russia and others demand that U.S. policymakers count on the amphibious fleet as a joint asset. The Amphibious Ready Group/Marine Expeditionary Unit (ARG/MEU) will be able to play a unique role in the first days of any conflict, large or small. They have the assets to influence the initial period of a future conflict, setting the conditions for larger joint and combined arms operations by theater commanders. In multi-domain operations, every amphibious ship will be a potential forward node for tactical data fusion. A combination of onboard sensors, the F-35B and future unmanned surface and aerial systems will allow the “amphibs” to provide wide area intelligence, surveillance and reconnaissance. 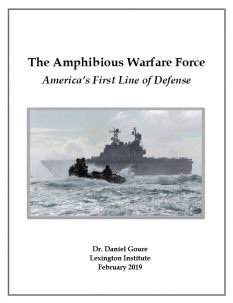 In addition to its role as an information collection, fusion and dissemination node, the amphibious warfare force is increasingly a lethal instrument of U.S. national power. The Marine Corps is experimenting with ways of adding long-range fires to the larger amphibious ships. In the future, directed energy weapons could attack unmanned aerial systems, small boats, helicopters, aircraft and other threats. With upgraded communications and data fusion capabilities, the amphibs can join the naval tactical grid, fighting in cyberspace as well as at sea. Then there is the role of the MEU in influencing the land environment. The combination of the V-22 Osprey, CH-53K King Stallion heavy-lift helicopter, the Amphibious Combat Vehicle, upgraded Landing Craft Air Cushions, lightweight and mobile artillery and rocket systems, armored wheeled tactical vehicles and Abrams tanks provide a potent force for rapid landings ashore to support raids and strike operations, even deep inland. Overall, U.S. amphibious warfare capabilities, embodied in the ARG/MEUs, represent the most flexible and complete combat capability this country possesses. According to Marine Corps Commandant General Robert Neller, “The multi-domain world demands a new look at tasks and capabilities for the amphibious fleet. It’s going to be a land, air, sea operation, but it’s going to involve space, it’s going to involve information, it’s going to involve the electromagnetic spectrum; all things that we haven’t had to think about in the past 15 to 20 years.” The current requirement for 38 amphibious ships covers the fleet size needed to deploy the assault echelons of two Marine Expeditionary Brigades. However, the Marine Corps is operating with 34 ships. This creates risk. A combination of 12 Landing Helicopter Dock (LHD) ships or Landing Helicopter Assault (LHA) ships, 13 Landing Port/Dock (LPD) ships, and 13 Landing Ship/Dock (LSD) ships or LPD Flight II vessels meets the minimum requirement. The frugal way to reach the 38-ship goal is to accelerate production of America/Bougainville-class LHAs and speed up procurement of the LPD-17 Flight II. The LPD Flight II has a proven hull design that could decrease risk and increase delivery speed in replacing the LSD class. This entry was posted in Defense, Studies. Bookmark the permalink.